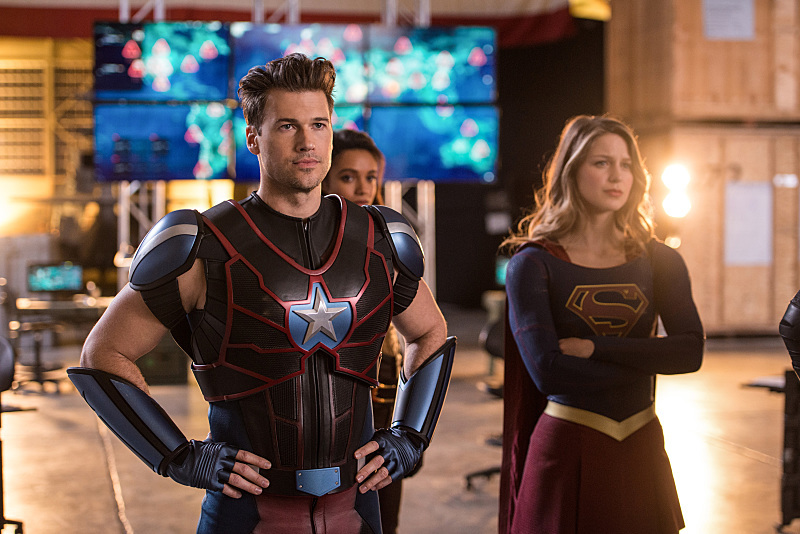 This is the finale of 2016’s big DC superhero crossover event in DC’s Legends of Tomorrow. For our reviews of the previous episodes of the week, check out Allyson’s reactions to Supergirl and The Flash, and my review of Arrow’s 100th episode here. 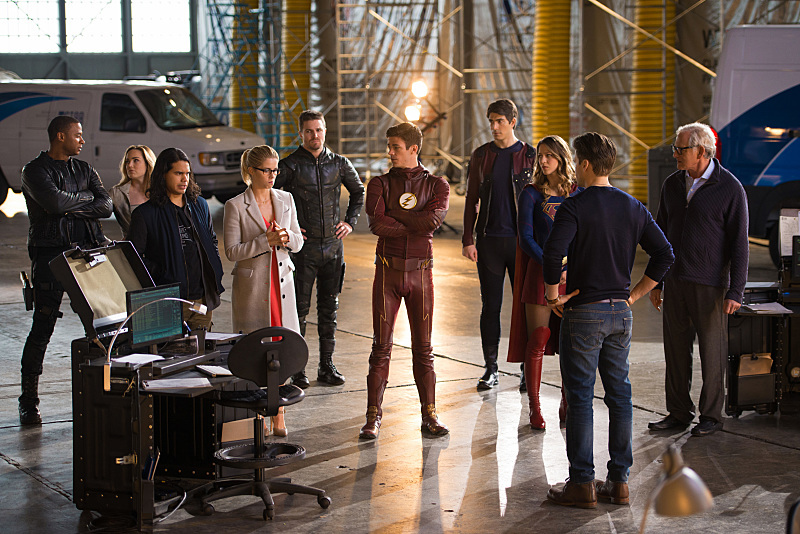 These crossover episodes have always been a challenge for the writers to create meaningful moments out of two independent plotlines with already massive character casts between The Flash and Arrow the last couple of years, and having seen the conclusion in this final episode of the “Invasion” crossover, it’s actually a great technical feat of the writers room and the production teams to balance four (mostly three) episodes of separate series between a cast of nearly 20 characters teaming together, and progressing the plot of each within both the context of their own storyline and of the alien invasion event. Let’s get the crazy-geeky excitement out of the way first: This is the closest we’ve ever gotten to a live action Justice League and the showrunners know it so well that the abandoned Star Labs hangar looks way too similar to what could become the Hall of Justice that it slightly angered me they didn’t actually say or do anything about it within the crossover. Not even a slight mention of reforming Amaya’s old Justice Society of America. We got an American flag hanging there, though. Close enough. I’m not actually mad about it though, seeing as hour they were legally bound by Warner to not do anything about Justice Leagues before the release of the 2017 film to avoid brand confusion. If it’s any consolation, though, I could do with this team instead. The cast here is strong enough as a while that I wouldn’t even miss the presence of Batman. Maybe we’ll see the formation of this Justice League by the time the Legion of Doom makes itself known to the Legends by the conclusion of it’s second season. 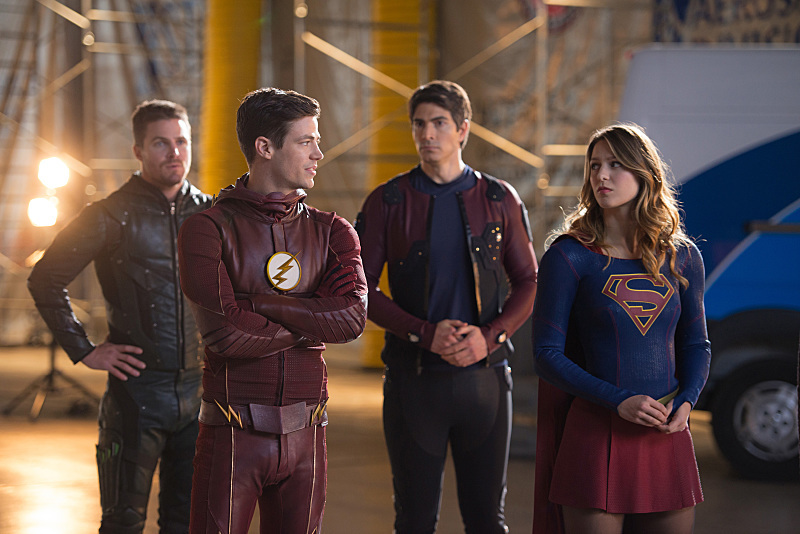 As previously expected, Barry’s creation of the Flashpoint event is to blame for most of the tragedies in this current timeline, namely in this crossover for the appearance of The Dominators, who appear to be looking to Metahumans as a danger to the galaxy, and expecting The Flash to hand himself over peacefully in exchange for the safety of humans and Metas on his planet. In the meantime, we’re treated to a handful of plot progressions as the Legends cast gets to shine the most here with Steel, Mick and Amaya taking Felicity and Cisco back to 1951 to the first american-Dominator encounter to do some recon of their own. This time travel sequence mostly serves as character development for Cisco to make a decision to save the captive Dominator at the hands of the MIB/FBI, and tipping the scales of time aberration effects so that he can feel the same weight of guilt from changing the timeline in the way Barry has since Flashpoint. This is all for the better, as Cisco’s anger rut he’s been stuck in, while justified, had stunted his friendship with Barry like a jersey barrier in The Flash’s plot. Stein finally comes to terms with his own effect on the timeline, as he meets a woman who turns out to be his daughter, conceived not long after he’d told his younger self to cherish his wife and family in the 1980’s a few weeks ago. While the plot didn’t get a lot of screen time, Victor Garber’s chemistry with Christina Brucato, who plays his daughter Lilly works fantastically, and the plot serves as some payoff in the crossover’s climax where Stein shares that loving attachment with Jax while they attempt to transmute a Metahuman bomb as Firestorm. One of my favorite moments of growth in character is Oliver’s acceptance that his life is very different from when he got back from Lian Yu. As the Green Arrow he’s survived the birth of the Flash and of Metahumans, magic villainy in Damien Darhk and now with the introduction of aliens coming to earth, he feels disassociated and useless, and takes it out on Kara early on in the episode as they prepare for their final rush against the Dominators. While the action scene in the finale looks great by network TV standards, the best part is the nonverbal interaction between the Green Arrow and Supergirl, and the character moments between him, Barry and Kara in an awkward group hug and an invitation to call for help at any time. The last several minutes, when the Earth isn’t in peril is one of my favorites over this whole week as we see these characters enjoy one another’s presence as friends, most exemplified in Oliver and Barry accepting the non-normalcy of this live giving themselves a sense of meaning. Next ArticleTV Review: Shooter 01x03 "Musa Qala"